We are starting to get invited to more and more birthday parties at Logan's school. If I was a good crafter, I would make a bunch of extras like these to have on hand for the next ones. :) By the way, I made the car caddy for G-money - but I forgot to take a photo!! 1. 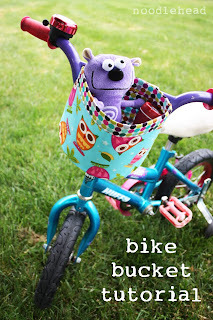 Every kid needs a cool bucket for their bike!! Tutorial by Noodlehead. 2. 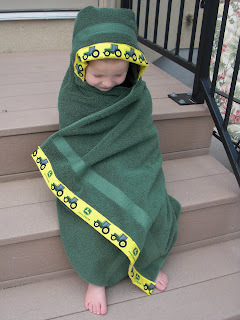 I posted before about making hooded towels. Why didn't this dawn on me before? Here's another by Obsessively Stitching. 3. Every young girl (or boy?) 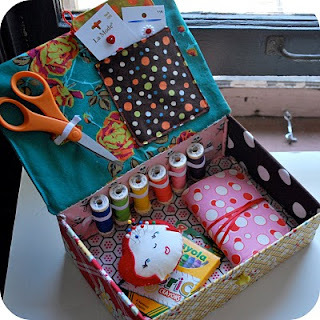 would enjoy this great sewing kit by Chez Beeper Bebe. 4. These bean bags from The Idea Room are so cute, and a great tool for learning math!